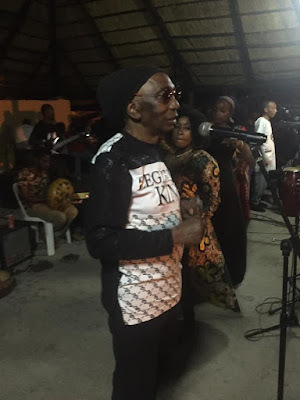 Chimurenga musician Thomas “Mukanya” Mapfumo is yet to return to the United States having flown into the country at the beginning of December last year for countrywide gigs running under the banner Mukanya Peace Tour. The tour, which was organised by local promoters Entertainment Republic and Chimurenga Music Company, did not go according to plan due to a plethora of challenges. However, a month after the tour Mukanya, who was supposed to go back to the United States shortly after the Peace Tour, is still in the country doing shows. On Friday the Mamvemve hitmaker was at Tanza Centre in Chitungwiza for the second time having performed at the leisure centre during the first week of January. He has done shows in Harare and at growth points such as Guruve as well as Mt Darwin under the banner Mukanya Farewell Gig. “The deal between Mukanya and Entertainment Republic failed to raise the expected income. The Peace Tour was just a flop and Mukanya is just doing shows to cover up the shortcomings,” said a source. “I think the organisers of the Peace Tour sold the old man a dummy. They knew that the economy was not doing well and 10 gigs around the country were too much for him. However, Chimurenga Music Company publicist Blessing Vava thinks otherwise. “The Peace Tour was a success, but we faced challenges due to the economic hardships, people had no disposable income to come for shows,” Vava said. Vava justified Mukanya’s long stay in the country. “He has stayed for long because he was really missing Zimbabwe, people should not ask why he has not gone back. His home is Zimbabwe and he is enjoying the country he missed for 14 years,” he said. Effort to get a comment from Entertainment Republic were fruitless. Meanwhile, local artists have taken Mapfumo’s rant on ZTV on himself and the late Oliver Mtukudzi being the only internationally-acclaimed musicians with a pinch of salt. Last week in a live interview on ZTV news, Mukanya described Mtukudzi and himself as the only internationally-acclaimed musicians to ever come out of Zimbabwe, while belittling Macheso and others. Australia-based musican Vusa Mkhaya who has travelled around the world with the Insingizi, a group which has performed at many big stages and won international awards, said Mukanya’s rant was misinformed or just arrogant. “I think the old man’s statement was inappropriate. Its either he is not informed or he is just ignorant, as an elder he should have spoken about Tuku only and not use the platform to undermine Macheso and everyone else’s hustle. There are several groups doing amazing things internationally that are on the festival circuit and performing in theatres across Europe and the United states such as Nobuntu, Mokoomba, Iyasa, Black Umfolosi, Insingizi, myself Vusa Mkhaya, just to mention a few,” he said. Jeyz Marabini said Mapfumo could have been just joking but if he was serious that was rather harsh. “I think Mapfumo was just joking because Macheso also has travelled around the world, and music appeals differently and we all have a certain crowd that we carter for and regions, I have also travelled around the world,” he said.